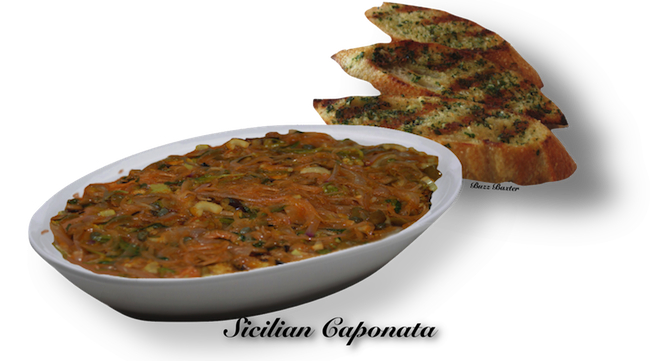 A MIX OF A VEGETABLE MEDLEY C0OKED DOWN TO A SPREADABLE CONSITENCY TO SPREAD ON TOASTED BREAD AS IN A BRUSCHETTA. There are two recipes here, one on the savory side and the other "an agro-dolce" or sweet side. The main ingredients for a caponata are eggplant, onions, celery, tomatoes and olives. You can add to those of course to make the caponata, sweet, spicy, acidic and everywhere else in between. No matter what you do, you are just adding another level of deliciousness! 1. Remove the stems from the eggplants and discard. squeeze well, and dry with absorbent paper. Set aside. 8 minutes until slightly softened. Pour in tomatoes; add basil, salt, and pepper. to the skillet with the onion and celery mixture, stirring until evenly mixed. 6. Refrigerate for at least 24 hours, or up to three days. Serve warm or cold. just begins to soften, then add garlic, red pepper, eggplant, zucchini. 3. Toss to coat with oil. Add the tomatoes. Add the vinegar, raisins and olives. Italian bread and just keep piling it on and enjoying it.